"I'm going to have a f**king heart attack!" When it comes to pranks, especially on the receiving end of them, there is a very Irish way of responding to them. 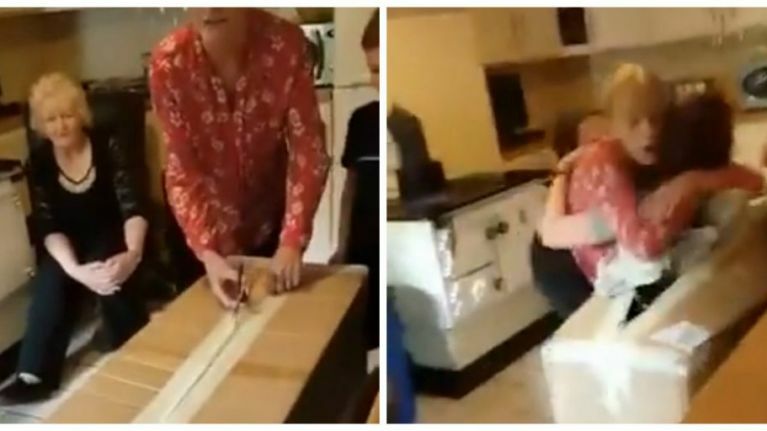 And that is exactly what happened when Breda Doocey returned home from Canada after a year away, disguised as a birthday present for her nephew. Also in the room was Breda's father Michael, her grandmother Breege, and her mother Anna, who goes at the box armed with a pair of scissors. You can actually hear them joking about Breda being in the box, but then get the fright of their lives - watch out for those scissors! - when Breda busts out of the packaging and sends the room into a state of profane shock. Cheers to Breda for sending this our way. Got a story for JOE? Fill out our online form here.